Veterans – Do You Know Where Your DD214 Is? I have been working on getting Veteran’s Administration benefits for my dad who is 86 and does not have a lot of money and needs to go into a care facility. The report of separation form issued in most recent years is the DD Form 214, Certificate of Release or Discharge from Active Duty. Before January 1, 1950, several similar forms were used by the military services, including the WD AGO 53, WD AGO 55, WD AGO 53-55, NAVPERS 553, NAVMC 78PD, and the NAVCG 553. Without that document, you cannot do anything towards receiving Veteran Benefits and if you don’t have it, getting a copy is EXTREMELY time-consuming. Also, be aware that if you have it and make copies of it, make copies front and back. There are stamps on the back that also need copied. If you cannot find it, there are a couple of ways to get a copy. One way, if you are lucky, is if you or the person you are looking for the document for has ever belonged to the American Legion. There is a possibility that the Post they belonged to has a copy of their DD214. Unfortunately, the post my dad belonged to did not have a copy, but they did have some useful information such as when he entered and left service, what branch and his Navy ID. I called our local VA officer and he pointed me to a government website where you can request a copy of your DD214 (or other military personnel records). It is called eVetRecs. And here is a link to a general FAQ from the VA on obtaining a copy of your DD214. Here is the website for the National Personnel Records in Saint Louis, which is where most of the records are stored. And here is general information page about the Military Personnel records and here is an FAQ page and another one for Veterans. 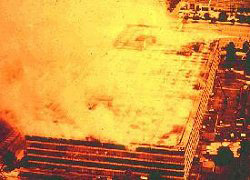 However… here is the kicker (and this is direct from the National Archives Military Personnel page on the fire), on July 12, 1973, a disastrous fire at NPRC (MPR) destroyed approximately 16-18 million Official Military Personnel Files. The affected record collections are described below. No duplicate copies of the records that were destroyed in the fire were maintained, nor was a microfilm copy ever produced. There were no indexes created prior to the fire. In addition, millions of documents had been lent to the Department of Veterans Affairs before the fire occurred. Therefore, a complete listing of the records that were lost is not available. Nevertheless, NPRC (MPR) uses many alternate sources in its efforts to reconstruct basic service information to respond to requests. Here is a link to The National Personnel Records Fire: A Study in Disaster. This is a 29 page study of the fire that appeared in the American Archivist in 1974 and linked to from the National Archives page on the fire. Thankfully, my dad was in the Navy, but otherwise, I don’t know what we could have done. eVetRecs is a nice online tool, but you do need to know several pieces of information, such as the branch, officer or enlisted, ssn, date and place of birth, approx date of separation and most difficult, their service number. The American Legion post information was invaluable for this. Miraculously, as I was looking for dad’s birth place on some papers he had marked “School Papers”, I found his DD214. We were so, so lucky. I was getting a timeframe of when we might expect the DD214 if we traced it as 1 to 6 months or more. And unfortunately, usually the time that people need it is when the situation is such that they need the benefits quickly. And I have still barely gotten anywhere on the process for dad even though it has been about a month, but at least I can plug away at it, which I couldn’t even have started until I got his DD214 if I didn’t find it. So, Veterans! Take care of that document and treat it as if it were gold. Even a will can be replaced by going to the attorney who did it (although dad’s will is lost and he can’t remember who he went to, but that is a different story). But the DD214 is a really, really important document, if not now, then in the future when you need to get your rightful benefits and may not be in good physical or mental state. And make copies front and back and make sure you can find them. If you have kids that are old enough, give them a copy. I’m not sure if it needs to be certified, but that would not hurt in the slightest. Just please, whatever you do, don’t lose it. Because someday you or your kids may be trying to get your benefits for you and then you will realize how important it is.